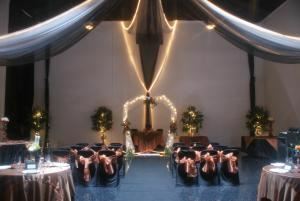 We are a full service special events facility specializing in Wedding Ceremonies and Receptions. Whether you are planning a business meeting for 20, an intimate gathering of 50, or a formal reception for 175, we can provide the perfect setting. Our warm ambiance will make your guests feel at home. Every event at Blooming Creations offers gracious service by our professional staff. Your guests will feel welcome as we oversee all of the details that will make your event memorable, allowing you to relax and enjoy your party!